This website kind of fell to the wayside, but don’t worry — it has nothing to do with lost interest, and yes, I’ve been gaming. Not finding too much “new” to mention following the completion of Sonic Chronicles. My last post pretty much nailed the majority of my thoughts on the game. The only things I can add are that I never frequented stores, level-ups never made me feel more powerful, I enjoyed turning into the golden Sonic for the boss fight, and I was less excited about the game starting over after victory and realizing nothing had changed. Overall, I enjoyed the title and would probably check out a sequel. Playing Saints Row 2 — which wasn’t really any different from the first Saints Row. SR2 is pretty much a clone of SR1. Same bugs, same balance issues, same problems, but… same fun missions and gameplay, and a whole lot more of it. It’s definitely one of the most fun games out there to play. I think the only thing that felt different to me between the two games is that I had a lot more respect earlier on in the game, but that might just be a result of knowing how important respect is and focusing on it. I will say that I prefer SR2’s crib-focused respect over SR1’s clothing-focused respect. Now that I’m caught up, it’s on to… Dragon Age: Origins! I’m currently playing Dragon Age: Journeys, a fairly decent web game that ties in with the main title (DA:O) on a promotional level, but also unlocks some additional items and perks. It’s only supposed to be about 2.5 hours but I’ve been playing in such tiny doses that it feels like I’ve been playing for weeks. Ambush! I think I’ve figured out how to ambush. It seems like when I walk up behind an enemy, I get a free rounds of attacks. That makes combat much more easy. While there may be a better chance of earning an ambush if you attack an opponent from behind, it does not seem to be a rule. I just discovered that Knuckles can climb. I’m pretty sure I came across a climbing location earlier in the game — when I had Knuckles — and I couldn’t climb, so I assumed none of my group could climb and never tried to climb. I figured one day I’d get a ladder or something. 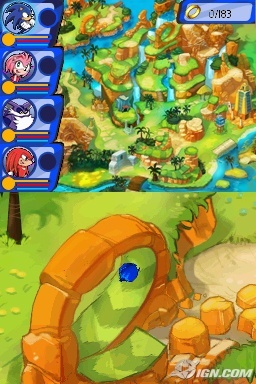 After being stuck for a while, I was playing as Knuckles and came across a climbing location and saw that the ability was now enabled. It makes me wonder if I just wasn’t allowed to climb before. Regardless, the game should have let me know that I had this ability now. I trudge back-and-forth a lot. Early on, I just felt like I was re-tracing my steps a hundred times. Maybe I wasn’t using the mini-map enough or maybe the game wasn’t clear enough. The combat tapping/combos are growing wearisome. I wrote, earlier, that they were keeping me invested into the fighting. Now I wish I could skip it entirely. Maybe there could have been a “you did the same attack 20 times. You’ve mastered it! You don’t have to do it anymore!” reward. Or a skill you could put points into so that you didn’t have to do the taps anymore. Or an item to let you skip the requirement for that round, or a piece of equipment/chao to let you skip them entirely. Some of the taps are too hard/easy. When I come across a boss and he uses his earth-shattering attack of devastation, I should have to do more than tap the screen eight times in two seconds. On the other hand, it’s really frustrating when I cast “revive” to bring back a fallen companion and fail multiple times in a row because I miss one tap out of nine. I wish Revive would always work, but if you failed the taps you’d receive none of the healing to which you’re entitled. Some of the grunts (weak opponents) have attacks that are quite damaging. I’m looking at you “self-destruct”. When you can hit me for a couple hundred points of damage you’ve got my attention. Is it bad that I stress out more about these grunts doing their self-destruct than a boss unleashing Hell? Probably. One power I like from an opponent is the one where they heal if they have a friend who is still active. Talk about strategy! It forces you to time it so that all the opponents fall in the same round. If you get the timing just off, it’s like the fight starts over from the beginning. That’s a good challenge. Another good opponent tactic comes when I nuke off all the weaklings so I can focus on the big guy, and then he re-summons another wave of weaklings. Ha! The game needs more surprises like that. When you’re only fighting one guy, why does the game ask who I’m attacking? It just adds needless input. An opponent might, for example, end the round by going into “evade” mode. This makes them almost impossible to hit. But you know that they’re going to make an attack with their first move of the next round — removing their evasion. When that first round ends, I wish I could issue a “delay” command, whereby I don’t attack until my opponent has attacked. It gives him first shot, but would prevent all of my attacks from being wasted. I have a suggestion for item usage. When I open my list of consumables, I get a list of my items but no description of the items. The DS has two screens, so there’s no reason there couldn’t be a pop-up of some information somewhere. It’d be great if I didn’t have to memorize what Bug Spray or Iron Tonic did. I thought of one other comment. Your Chao friends give you bonuses like healing at the end of combat rounds — so long as combat is on-going. Since this is an easy way to recover health and POW points, there are times when I work the last opponent down to a few health and then defend for a round to heal. It would have been nice if you earned that end-of-round bonus even if you won the fight. The combat is probably worth a post all on its own, but I’ll keep this abbreviated. Fighting looks similar to your typical Japanese RPG (i.e. Final Fantasy) so I somewhat expected to button mash my way through endless battles while watching TV or surfing the Internet. I was wrong. You really have to pay attention to the combat for the QTE-esque moments. Basically, whenever you or your opponents do a POW attack (one of a character’s special abilities), the degree of success or failure is based on your ability to use the stylus to touch the screen in a specific place a certain amount of times, or at the proper time, or to follow a moving target to make a line. I can’t say how much I’ll like this 10 hours down the road, but right now it’s fun and, because it parlays player skill into an advantage, keeps me engaged. If you can see the image clearly enough, there's a large red circle and some red dots below it. You put your stylus down on the circle, and then drag it along the length of the line. As for frequency, it’s a good amount so far. Each map has a few re-spawning creatures that mill about. You can dodge them if you don’t feel like fighting, or wade in if you want to earn some loot. Last comment here, occasionally enemies break rank and flee. This jumps you to a mini-game where your (up to) four heroes give chase while crates, rings, and speed boosts litter the ground. Touching one of your characters with the stylus causes that specific character to jump, so the idea is let everyone hit the speed boosts and jump for rings and over the crates. Sometimes I’m happy to let the opponents escape but when you’ve just about finished off a tough encounter, you’ll be focused in on making sure you don’t lose out on your loot and experience. It’s good at times but I’m adding this section because it’s annoying at others. Some of the sounds and music are a bit shrill coming out of the tiny Nintendo DS speaker and it makes me want to shut the volume off. But as I’m a bit new at the game, I’m using audio cues to help me out and I don’t feel comfortable giving that up just yet. This results in me turning it as low as I can and trying to tune out the bad notes as much as possible. I will say I enjoy the sound of collecting rings; brings back good memories of the Sega Genesis. Nothing too special here. I mean, nothing to the depth you’d get out of one of the Sword Coast games like (NWN) Neverwinter or BG (Baldur’s Gate). Most encounters feature a linear path through the conversation, though you may get an opportunity to interject a snarky comment or ask for a little more information. More rarely, you get a chance to ask your group for their thoughts, but that only leads to a quick series of one-liners. Same goes when you get the chance to talk to your group at the base. Again, I’m not expecting the depth of NWN or BG, but to this point I really don’t know anything about my companions other than really, really simple observations: Tail’s works with electronics, Amy has a boyfriend, Knuckles is impatient, Rouge and Amy don’t get along, and Big has a thing for frogs. Then again, maybe that’s all I need to know. There appears to be three classes: shifter, power, and support. I’m not entirely sure what each does and it doesn’t seem to matter too much at this point. My reasoning for selecting the group I have (you can only travel with Sonic and three others; if you have more in your group, they hang out back at the base) is based purely on a) laziness — I assigned “Chao” (small, mysterious creatures that give you bonuses like health regeneration) that I like to specific people and I want those Chao with me, and b) navigation abilities — Sonic can run through tunnels, Tails can fly over gaps, and Big can walk through swamp gas. I’m not sure if my entire group is earning experience, but if they aren’t I’m even less likely to change things up until the inevitable (my guess) moment in the story where I’ll be forced to make a switch. This is one of the low-points for me with the game. I’m on a fairly small map at this point — I have three stages accessible to me: a city, a swamp, and the starting area. To this point, I keep getting quests telling me to look for objects which are scattered about these three regions. I feel like I’ve gone back-and-forth over the same territory a hundred times by now, and I don’t know if there’s an end in sight. It’s one thing to go back-and-forth if you know what you’re looking for, but I’m ducking into random caves trying to figure out if an area is worth checking out or not. Most of them aren’t, for the purposes of my quest. I’m not suggesting that the game tell me exactly where to go, but I have a sensor which tells me when I’m close to an object of interest. It might be nice if the device could point out a general direction or maybe let me know how many objects are around — and at which area, i.e. the device is picking up two blips in the swamp and one from the city. The story, like the conversations, is effective but simple. Dr. Robotnik is the big evil. Sonic and heroes wiped out his ship, but he escaped. I think I’m trying to find clues to capture him. One thing that I like is that when I load a saved game, I get a little re-cap of “The Story So Far”. Unfortunately, it could be a little more helpful. Right now, my re-cap tells me that I’m trying to find my old nemesis and, also, Angel Island. But it doesn’t say anything about my immediate goals. The journal is only slightly more helpful. One of my current quests tells me I’m looking for “strange devices” but it doesn’t tell me where they might be, how many there are, or how many I’ve already found. As for the lore, you have a Codex that tracks the back story of various items, places, and creatures you come across. I played the original three Sonic the Hedgehog games on the Sega Genesis, but the Sonic world has opened up a fair bit thanks to Japanese Sonic comic books and the Codex provides a nice summary of that world. I haven’t picked up on if there’s any notification that you’ve gained new entries, so I occasionally pop it open to see if there’s anything new. The information isn’t really useful, but it does provide some interesting context to help immerse you into the world. I have to be honest and say that if this wasn’t BioWare, I don’t think I’d be playing. But I also have to admit that I am having fun and find myself drawn to keep playing, so I’m glad I gave it a chance. And, as per usual with BioWare titles, the polish is high and I’ve only come across one (non-repeatable) bug (an animation glitch). I’d say it’s a solid offering for a BioWare Nintendo DS title.